Wednesday - September 3, 2014: We learned today, that Glenn Stark, the amazing self taught artist who lived in Kingman, passed away yesterday. As his dear wife, Mary said, "His 97-year-old body just wore out." Glenn had been unable to live life as he wished for the past 3 years and his passing is a blessing. Friday - September 5, 2014: At lunch, I made my second visit to the new Rock and Brews in Overland Park. It was a pleasant day and the big garage style doors were open to the patio. I was going to order the signature Ring of Fire chicken wings, but switched to the spicy Asian wings at the urging of my server, who said they were the most popular. The flavor didn't really work for me, some spice was off. They weren't terrible, but I wouldn't choose them again. My side dish was garlic French fries. They had a LOT of garlic. I enjoyed them, but they weren't a good choice for going back to work after the meal. We planned to get away a little early on Friday afternoon, but when Linda picked me up at the dealership at 4:30, the temperature had dropped over 10 degrees and we decided that we might want some warmer clothes for the weekend, so we drove both vehicles home. That later start combined with construction, rain and one wrong turn to make it after 8PM by the time we made it to Coffeyville, Kansas. At this point I have visited most of the attractions in Kansas which interest me, so these trips are becoming more important for the restaurants, both because they change and because new ones open. Tonight we went to Tavern on the Plaza. It had been so long since my last time there that the review was removed a few years back. 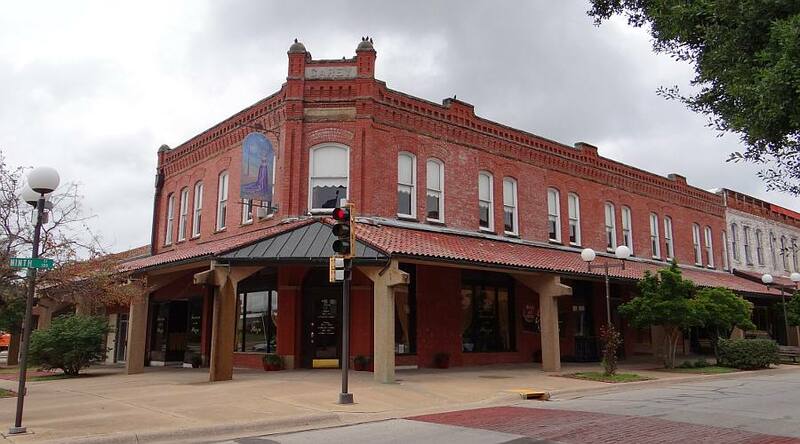 Tavern on the Plaza is in an attractively restored 1872 building which sits across from the two banks which the Dalton Gang attempted to simultaneously rob in 1892. That was the end of the gang. Four members of the gang were shot and killed, including brothers Bob & Grat Dalton. But to get back to the food, the Tavern specializes in hand cut steaks, burgers and smoked meats. They immediately failed one of Linda's tests for a steakhouse, when we spotted, "Medium well or well done steaks are not recommended or guaranteed." We started with Vidalia onion petals ($4/6 depending on serving size) with red pepper garlic dipping sauce. They were good with or without the sauce. The batter was a little sweet and the combination with the sauce was quite rich. I ordered a 12 ounce ribeye ($29). I've learned to order meat medium rare instead of medium in Kansas and this one followed the pattern, with the steak coming medium rather than medium rare. It was a very good ribeye and went well with the gilled onion and mushroom side dishes which I selected. Linda had fried catfish ($14) with corn on the cob and tavern fries. She liked her food, though her favorite part of the meal was the corn. The Tavern on the Plaza advertises that the building is haunted, so I asked our server if she was a skeptic or had experienced anything. She said that anyone who has worked in the restaurant very long has had experiences. She said the most common is hearing voices, or hearing your name called when there is no one there. She said that she was also there when some wine glasses were swept off the bar. Saturday - September 6, 2014: We had a pleasant night at the Coffeyville Best Western, sleeping in since the first place we were going to visit was delaying opening until 11AM because of overnight rain. 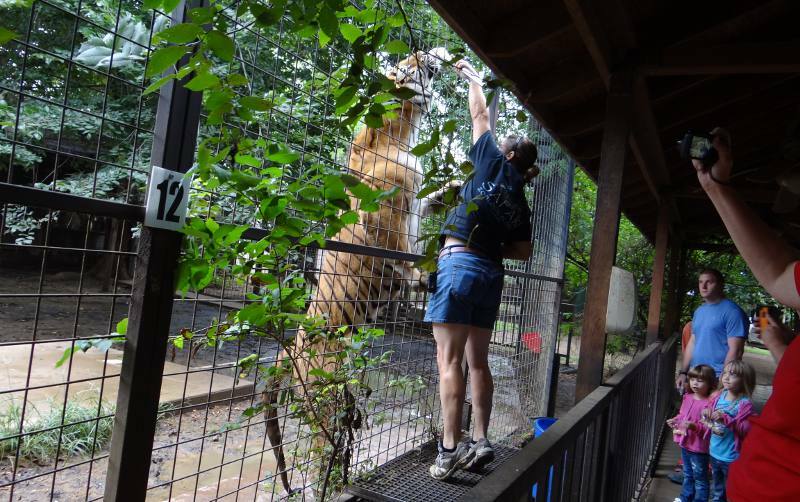 The Safari Zoological Park in Caney is a small, family owned zoo and often has irregular hours due to weather, so I had known to call the day before. Admission is $11 and rather than having the run of the zoo, is a 1.5 hour tour. Mary was the guide and she began our tour along with another family, a few minutes after we arrived. Other parties joined us throughout the tour, and at the conclusion of the tour, she would turn right around and take the late joiners through the parts which they had missed. The zoo has mainly large cats, canines, bears and many types of primates. It was a cool morning and the animals were quite active, excited as we approached, since they knew they would be fed. Visitors can purchase generic animal crackers to throw into the cages and the guide has a bucket with meat and more animal crackers. The most dramatic response was from the baboon troop, who were almost frantic as we approached. They were an interesting group, with the dominate male at the bars reaching out for food, while the smaller animals tried to beg without him seeing. With the tigers and grizzly bear, our guide stood on a raised platform next to the cages and held meat at the end of tongs, high over her head so we could see how large the animals were when they stretched up for the meat. She also used the food to get the hyenas to make their calls, which set the nearby coyotes and wolves howling. The slow start made it later in the day than I originally planned, so we then headed straight east with no stops until we arrived in Baxter Springs. 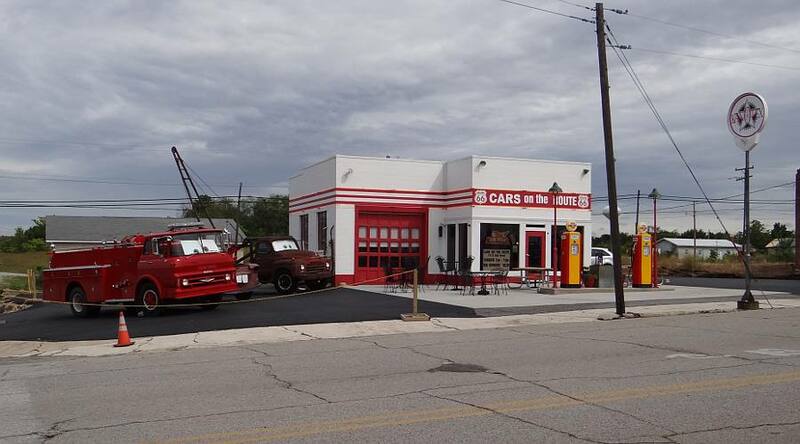 Baxter Springs is on Historic Old Route 66, on the Oklahoma border and I had several restaurants to check on. 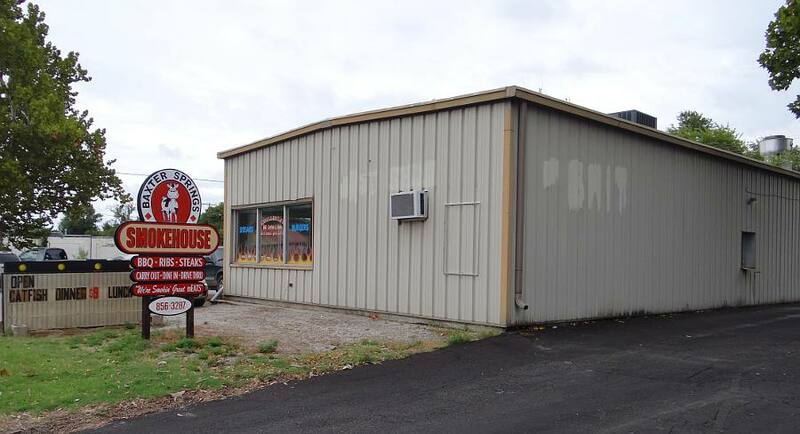 The first was Baxter Springs Smokehouse, which I think is misnamed. Near as I can tell, they do not smoke the meat. The ribs (while good) tasted like they had been cooked in the oven and I did not see a smokestack or wood pile. But the food was good, in most cases tasting much better than it looked. The food looked very plain when served. My favorite item was Linda's sausage. It didn't have the smoky flavor which Linda wanted, but the Polish style sausage with a liberal coating of the sweet BBQ sauce tasted pretty good to me. 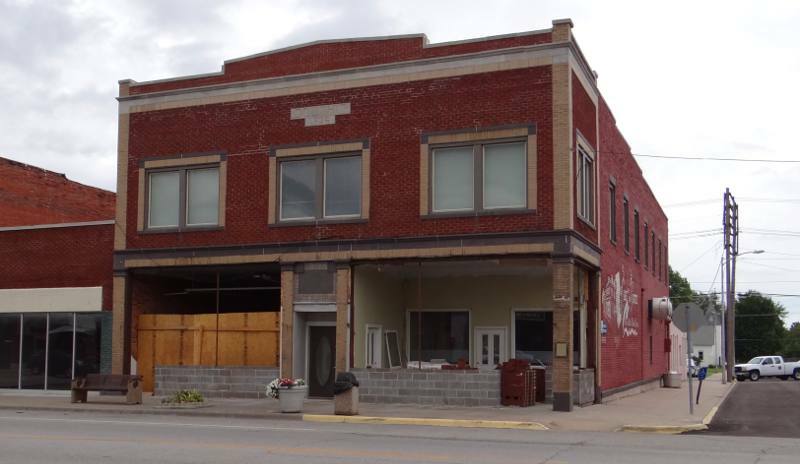 We then drove to the downtown to check on some other businesses, first taking photos and confirming that the former Cafe on the Route is having major remodeling in preparation for someone reopening it. Then we had our dessert, a house made cookie dough frozen custard at Angels on the Route, a 7 year old sandwich and gift shop in a 149 year old building. The custard was wonderful. We would have tried English toffee flavor as well, but they had run out and none of the other flavors appealed to me. We then followed the entire stretch of Route 66 in Kansas, about 13 miles, looking for places which had opened, closed or changed. Our principle stop was at the former 4 Women on the Route in Galena, which has changed owners and is now Cars on the Route. Melba Rigg (Melba the Mouth), who was one of the original 4 women, is no longer and owner, but continues to greet visitors and tell them of the many ways which the building, its mining boom truck, the town, and she herself are represented in the Cars movies. We retraced part of route and then drove up to Pittsburg, to join family for the Pitt State season opening football game. Pitt is the winningest football team of all time in Division 2. Pitt had an easy start to conference play, defeating Northeastern State (OK) 37 - 0, in front of the fourth largest crowd in stadium history. 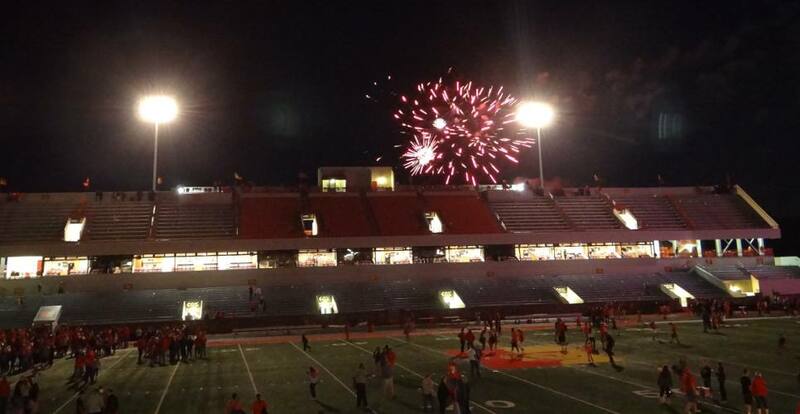 The game was followed by a fireworks display. Sunday - September 7, 2014: On our way back to Lenexa, we stopped for supper in southern Overland Park at Llywelyn's Pub. It had been several years since we dined at Llywelyn's. The atmosphere in the 100 year old former church is pretty cool, but the food doesn't quite make it to the level I would like. 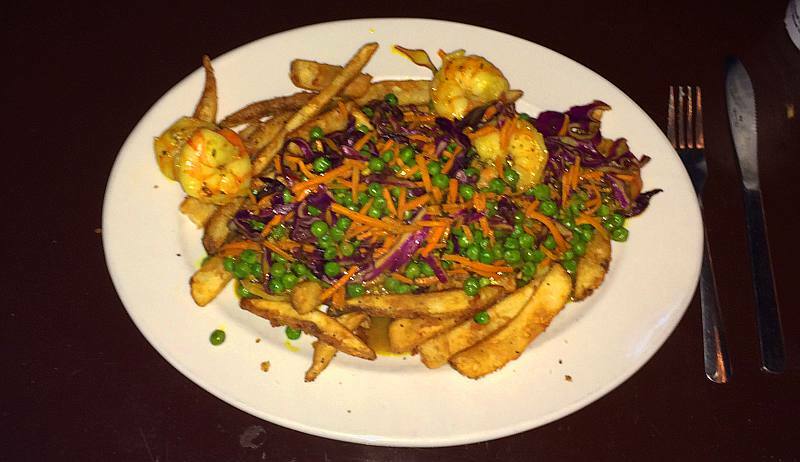 The shrimp curry on fries had a lot of peas and carrots, which took away from the the dish. The Fried Irish Pies sounded very appealing - four flaky pastries stuffed with corned beef, white cheddar and colcannon (mashed potatoes, cabbage and leeks). Served with Irish whiskey mustard. But the pastry was not flaky, they had little flavor other than the pastry and the mustard was nothing like what we recently had and liked in Ireland. 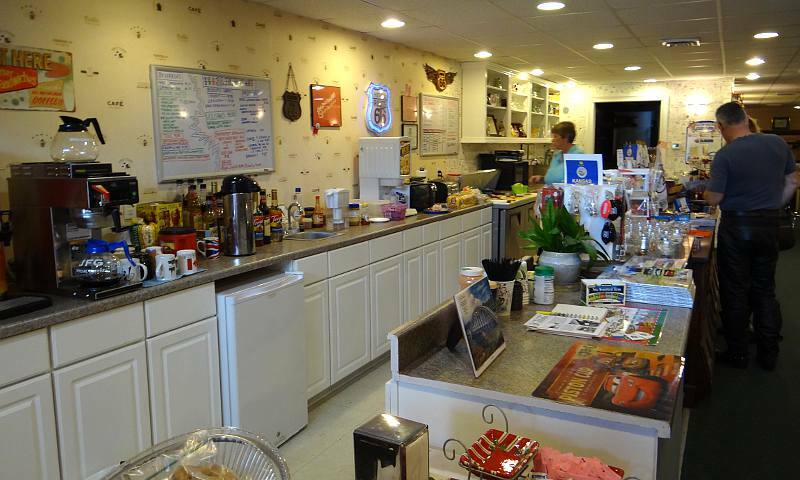 Saturday - September 13, 2014: Linda and I returned to Stroud's Restaurant in Fairway to update its listing. Linda had the fired catfish, for the first time. 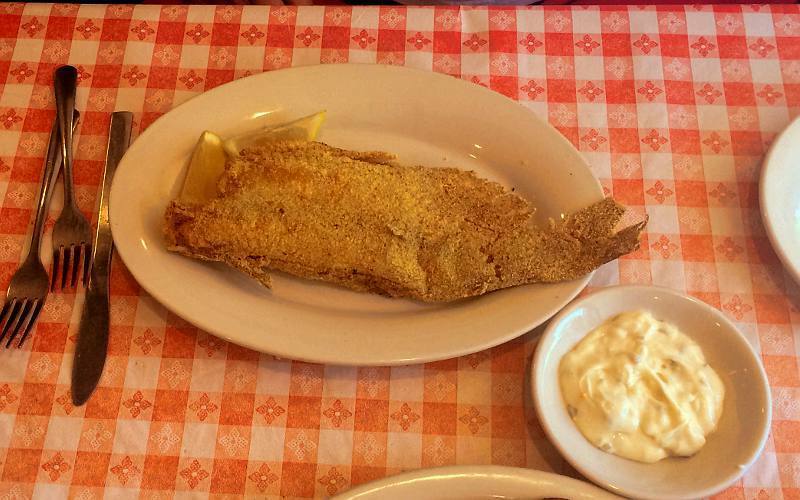 It was a whole catfish with a cornmeal coating. The server offered the choice of having it served whole or having the bones removed in the kitchen. The prices were unchanged from 2012. 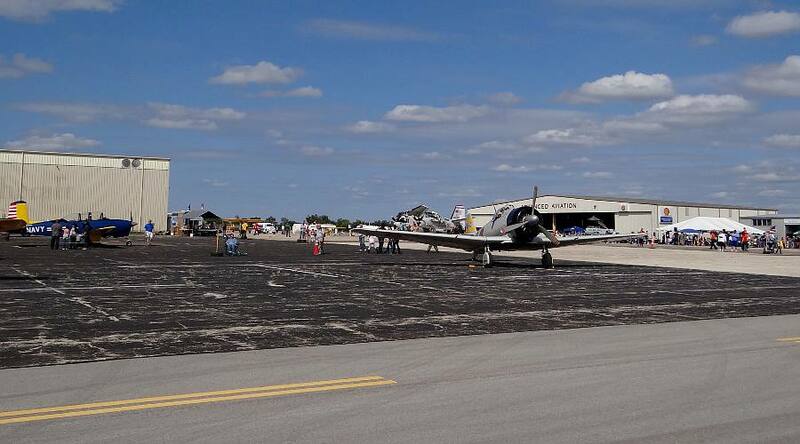 Sunday - September 14, 2014: On Sunday afternoon I went to the Commemorative Air Force air show at New Century Airport. My friends who narrate air shows didn't do this one, but Hooter (who is one of the announcer partners) was there as General MacArthur, a role he has done there several times, along with a local man who portrays Harry Truman. I hadn't seen Hooter for over a year and enjoyed chatting for about 30 minutes between the conclusion of the air show and my flight. Yes, my flight. 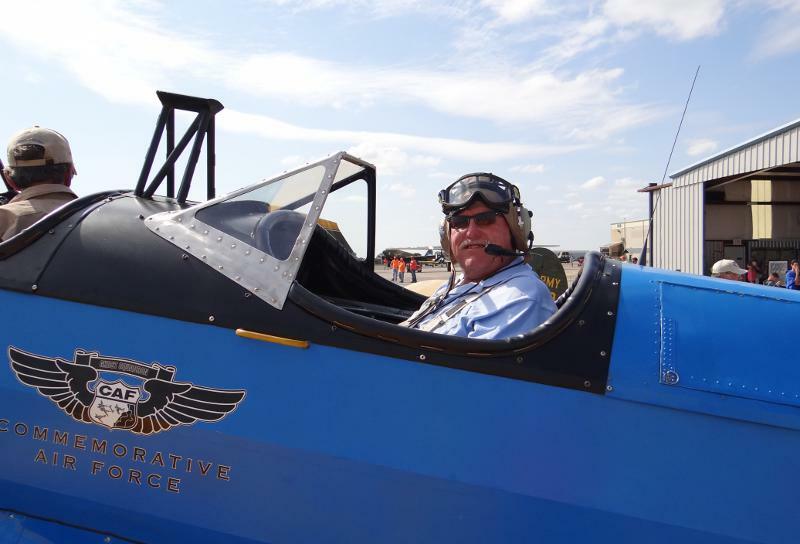 It was a 15 minute flight in an open cockpit Fairchild PT-19 which was used for training by the Army Air Forces (AAF) in World War II. The plane was a little awkward to get into, but the seat was comfortable once I was place. the seat belt includes two shoulder straps (I guess they don't want people falling out). Between those straps and needing to keep me & the camera behind the narrow windscreen to avoid the 100mph wind, it was rather awkward using my camera. Highlights of the flight were passing over the 440 acre BNSF Intermodal Facility, the former 10,000 acre Sunflower Army Ammunition Plant in DeSoto, and taking off following a B-17 Flying Fortress. Saturday - September 20, 2014: Linda and Mary joined me in a revisit of the Kansas City Renaissance Festival, a theme park sized fair at the west end of the Kansas City metropolitan area in Bonner Springs. One year at the festival is much like the previous one, but there are enough changes that I like to check it out every second or third year. 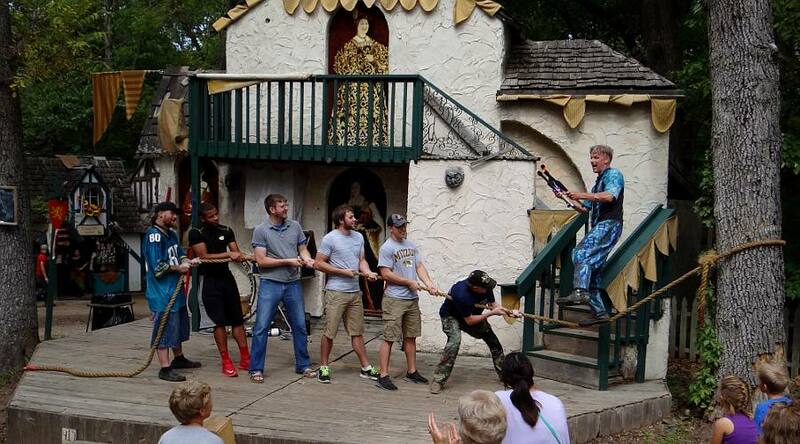 The biggest change which we noticed for 2014 is the White Stag Inn, which offers the first table service in the Renaissance Festival.